Try as one might to preserve the health of the teeth, it is unusual for a person to completely avoid oral health problems for a lifetime. Most people will experience at least some degree of tooth decay, which is one of the most common dental conditions. Decay damages healthy tooth enamel and increases the risk of more serious dental complications, such as root canal infection and tooth loss. Fortunately, restorative dentistry treatments repair oral damage and restore the health of the teeth before dental complications get out of control. There is a wide range of restorative dentistry treatments available to patients. Choosing the technique that is most appropriate for each patient’s unique situation is vital to successfully restoring the health and structure of the tooth. Here, the team at Signature Smiles discusses dental fillings vs. crowns with our Woodinville, WA patients. Minor cases of tooth decay are extremely common, which is why dental fillings are one of the most frequently performed restorative dentistry treatments. Dental fillings, also known as direct bonding, address minor to moderate degrees of decay to restore the structure of a damaged tooth. Dental filling treatment is a non-invasive procedure that can be completed in a single dental appointment. To prepare the tooth for treatment, all damaged tooth structure will be removed. Once the tooth is prepared and cleaned, one of our experienced dentists will apply a dental composite directly to the tooth. This composite is shaped to the tooth to rebuild material that has been lost to decay. At Signature Smiles, we use tooth-colored dental fillings so that we can restore a patient’s tooth without compromising the appearance of the smile. When the composite material is in place, it will be hardened to complete the bonding process and strengthen the restoration. Dental fillings are an effective treatment option when decay is limited to the outer layer of the tooth. These restorations are well suited to areas of decay that have not extended to the biting surface or cusps of the tooth. While dental fillings can repair many cases of decay, more advanced damage will require more extensive treatment. Dental crowns are more versatile than dental fillings. They can treat more advanced stages of tooth decay, as well as address a multitude of aesthetic flaws. Although dental crowns can restore and strengthen a damaged tooth, they do require the removal of a significant amount of healthy tooth enamel. For this reason, dental crowns should be reserved for cases that cannot be effectively treated with a dental filling, inlay, or onlay. 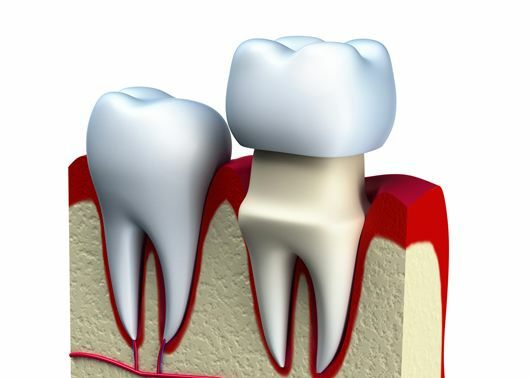 Dental crown treatment uses a process known as indirect bonding. As opposed to dental fillings, which are shaped directly to the tooth, dental crowns are fabricated in a dental laboratory and then bonded to the tooth. Because of this, dental crowns often require two dental appointments. At the first appointment, the tooth will be reshaped to eliminate all damaged tooth enamel. A temporary crown will be placed until the final restoration is complete. Once we have the final restoration, patients will return for their second appointment. At this appointment, the fit of the crown will be tested (and any necessary adjustments made) before bonding the crown into place. Both dental fillings and crowns can improve the health of a damaged tooth and provide protection to prevent further oral health problems. The best way to make a choice regarding dental fillings vs. crowns for the treatment of decay is to see an experienced dentist, such as those at Signature Smiles. Tooth decay is a minor dental problem that can turn into a serious complication without proper treatment. If you’d like to learn more about the restorative dentistry treatment options offered by our experienced team of dentists at Signature Smiles, schedule an appointment at your earliest convenience.